As we drift into the month of July, the Singapore International Festival of the Arts begins and we can ready ourselves for a whole lot of inspiration this week. Jeremy Sharma‘s multi-media installation as he explores the relationships between perception, memory, and fiction if you’re in the old for some introspection. The Hive’s open air cinema is also airing indie cult classic, Fight Club, while British artist David Hockney finally arrives to present his finest here. Wrap up the week with the help of some poetry and alcohol at Books & Beer, courtesy of Books Actually. Part of the Singapore International Festival of Arts, “Unsettled Assignments” features curated works that enable viewers to get a glimpse of life during the periods of conflict and peacekeeping in history. See the children who were born in Cambodia in 1993 to African fathers serving in the United Nations peacekeeping troops, or walk in the shoes of the South Vietnamese asylum- seekers in the aftermath of “the fall of Saigon” in 1975. Through residues left by these foreign military bases and camp-towns within the region, the artists employ visual aids like installations, workshops and film screenings, combined with the evidence, to create a historical flashback like no other. SIFA 2017: Unsettled Assignments begins 29 June till 9 July 2017, from 7pm till 10pm daily. For more information, check out the festival guide here or go on to the main site here. Heavily inspired by the functionality of aesthetics and production in art, Jeremy Sharma’s Spectrum Version 2.0 explores the relationship between perception, memory, and fiction through the usage of light and programming. Having developed an engaging new body of installation works with these images, videos, light and sounds, he produces a fleeting monument of memory that are all at once solid yet atmospheric. From this show, viewers can look to question their place in an increasingly fragmented and artificial reality. Either way, you are guaranteed to leave with tons of insta-worthy shots! Jeremy Sharma’s Spectrum V2.0 begins 29 June till 20 August 2017, from 11am till 7pm daily at Sullivan + Strumpf Singapore, 5 Lock Road, #01-06, Singapore 108933. For more information, check out their website here. After a successful screening of Moulin Rouge, Singapore’s Open Air Cinema Club is back to bring you, yet again, another cinematic experience. Follow the life of Edward Norton as he meets a strange soap salesman named Tyler Durden (Brad Pitt) and forms an underground fight club with a bunch of iconic rules (that we can’t tell you about). Be sure to look out for Helena Bonham Carter’s stellar performance and the killer chemistry between Brad Pitt and Edward Norton. With a beer and snack in hand, enjoy the fresh air and a cult classic for the days. Fight Club will be screened 30 June 2017, from 7.30pm till 10.30pm at the Hive Co-Working, 59 New Bridge Rd, Singapore 059405. For more information, check out their event page here. In celebration of their 15th anniversary, STPI Gallery brings in Britain’s most celebrated living artist, David Hockney and a selection of 36 carefully curated works. 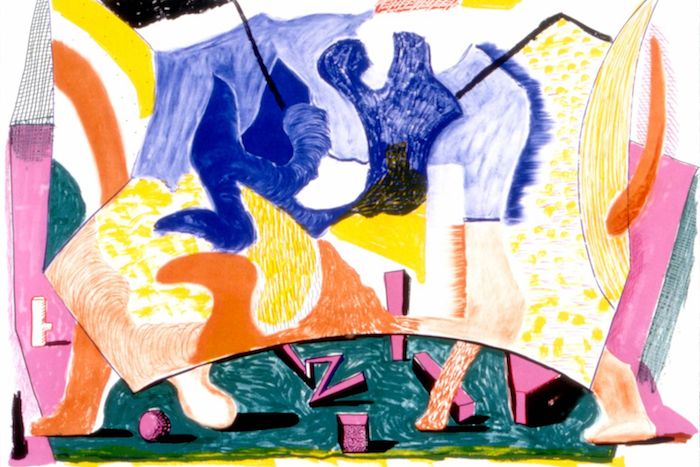 Hockney has been pushing boundaries since the beginning of his career; known for his portraits and vast landscapes that have been raved about over the span of the last six decades, he has not stopped experimenting with numerous materials and methods. Embrace his open-minded approach to art and technology and find out what it means to be relevant and timeless in the scene. David Hockney: A Matter of Perspective will happen 1 July till 9 August 2017, from 9am till 6pm at STPI creative workshop & gallery, 41 Robertson Quay Singapore 238236. For more information, check out their website here. Books & Beer returns for the sixth time, and this time, our favourite indie bookstore, Books Actually will be showing up with their armoury of curated literature for your perusal. Cyril Wong, poet and author of ‘Below Absence’ and ‘The End Of His Orbit’, will also be gracing the event with a reading. This event is perfect for those you who have always wanted to get started on reading but haven’t quite found the time. With beers and food at your disposal, why not grab some loved ones and immerse yourselves some of Singapore’s best reads? For the minglers, be sure to bring some of your own books to swop out. Who knows, you might even gain a couple of friends in the trade! Books & Beer will happen 1 July 2017, from 3pm till 6pm at The Belljar, 8 North Canal Rd, Singapore 049930. For more information, check out their event page here.